Airtel has rolled out a new referral scheme in an attempt to motivate the telecom operator's numerous postpaid customers. As part of the referral programme, Airtel postpaid users can get Rs. 150 in bill discount coupons on successfully referring a customer and making them switch to an Airtel postpaid account. On successful referral, the new customer will also receive the same benefits - three bill discount coupons worth Rs. 50 each. The discount coupons will be credited to the linked number on the My Airtel app, and can be used while paying your postpaid bill. 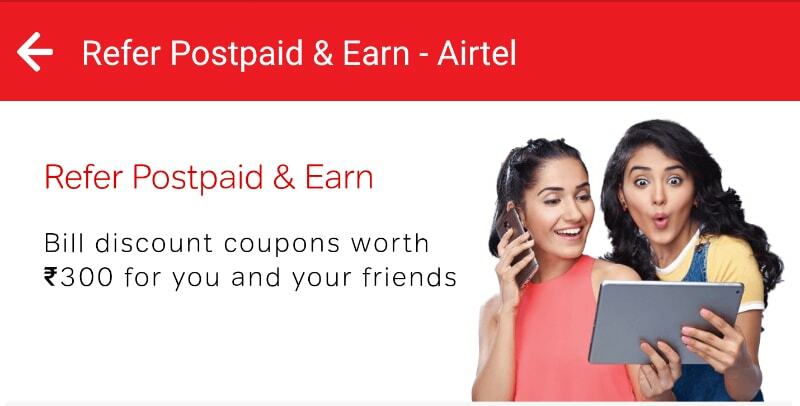 Both you and your referee will receive the discount coupons within 24 hours post successful activation of the new Airtel postpaid connection, says Airtel. The offer will be applicable on a maximum of 10 successful referrals, giving the referrer Rs. 1,500 in discount coupons. The Airtel postpaid referral scheme can be availed by accessing the My Airtel app on Android or iOS, and logging in to your account. Once done, scroll over to the Notifications area and click on the “Rs. 150 discount on your postpaid bill” option received on November 15 or later. Copy the code and share it with prospective referees using any of the social media buttons or by sending it manually. Once your friend clicks on the link and completes the online process, an Airtel executive will contact them to complete the process of switching over to Airtel postpaid. Both of you will then receive the coupons upon successful activation. The offer is exclusive to existing Airtel postpaid customers and Airtel prepaid/ Airtel broadband/ Airtel corporate users cannot become referrers. As we mentioned, the telecom giant states that there is a limit of receiving rewards for only up to 10 successful referrals, which means that you can effectively avail up to Rs. 1,500 in bill discount coupons. Only one of the three Rs. 50 discount coupons can be applied during a single transaction. The discount coupons will only be applicable on bill payments of the registered mobile number of the referrer or the referee via the My Airtel app only.